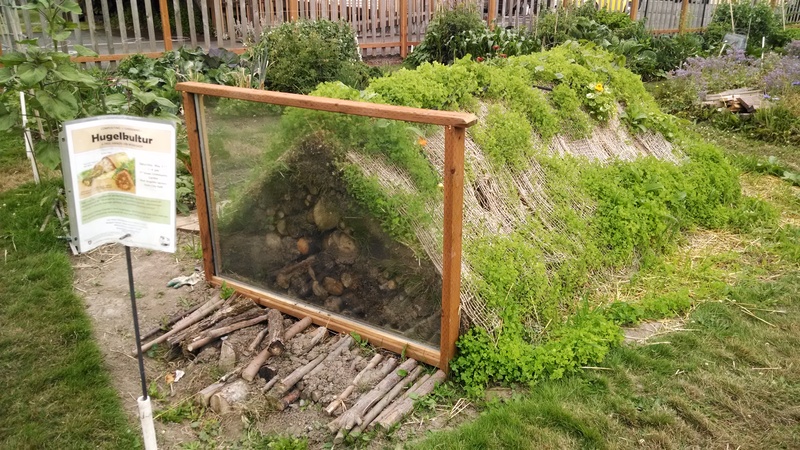 Hugelkultur is a traditional Eastern European gardening method which was modified and re-popularized by Austrian permaculturalist Sepp Holzer. Translating to “hill culture,” this method involves covering a pile of logs and branches with dirt or compost. This imitates the natural process of a tree growing out of a dead tree covered with pine needles in a forest! Hugel beds are “self-tilling”; generally store a season’s worth of water once mature (even in the desert! ); increase gardening surface area due to the steep slopes; and are great for areas with thin or poor soil. Further, due to the high slopes, the north and south sides have different growing seasons. Something in full sun on the south side in full sun could be the earliest of that crop you will see in your whole region! Hugelkultur is also a great way to use excess logs and brush if you are on a forested property. However, if you are hauling them from offsite it is quite labor consuming! And if you’re concerned about global warming, it is a way you can quite literally sequester instead of burning the carbon which grows on your property. A Hugelkultur bed over 20 years. I believe they shrink a decent amount more than this shows. My home is on a rocky outcropping overlooking the Palouse River, with the bare side facing the southwest, the consistent windward direction. This has presented unique challenges for my side yard garden project and anything else I have wanted to do in my yard or deck (a lot of my sunflowers fall down.) In the windward direction my soil drops off rapidly, and runs out of water rapidly in the summer. In some places it is rocky all over, and only inches from bedrock. Beyond this, the crop rotation system in my garden makes it difficult to find a place for some crops, such as perennial vegetables. Solution to my woes? Hugel beds, of course. So far I have made two, but have big plans to continuously make more across the hillside. My biggest plan right now is to make a circular outdoor living space surrounded by a hugel bed. That hugel bed would only be about 3 feet high. I wish I was good at drawing garden designs, but I am not, so this one stays in my head for now. The base of the peach tree hugel bed. I like to use cardboard for the extra bit of organic matter and to stop extra aggressive weeds, but it isn’t necessary. To build a hugel bed the first thing you do is carve out the turf. It is important to save the turf, you will want it later! I made this one four feet by four feet. Putting cardboard at the base is optional. The first layer of the peach tree bed. After the area is carved out, you can begin piling logs. It is best to either use freshly cut green wood, or wood that is already rotting. Cured wood like you would use for firewood takes the longest to break down and begin to absorb water. Avoid woods like cedar, which takes forever to break down. Also, avoid strongly allelopathic trees, such as black walnut. For this bed I used old poplar which was on my parents’ property across the river. It had been on the ground and was nice and rotty. The advantage of highly rotten wood is that it is already releasing nitrogen, instead of absorbing it. The downside is the hugel bed will have a shorter lifespan if all of the wood is rotten. For a square bed like this the wood is just piled up into a pyramid. This one was about three feet tall. I like to “seed” these with really rotten wood so there is more bacteria and fungus, but I have no evidence this makes a difference. The next step in a hugelkultur bed is to put smaller branches on top of the thicker branches in the middle. The smaller branches on the outside break down faster, while the bigger logs in the center provide longer lasting absorption and fertility. For this bed I used old branches from the aggressive elm trees I had destroyed over time. It was not ideal to use fully dried out wood, but hugelkultur is all about using the materials at hand where possible. By the time these branches have covered the mound of logs it has gotten wider than the base size. Often these are laid laterally, but due to the size they were mostly pointed towards the top. Generally one cuts some pegs from wood to hold branches up. Old elm branches over the chopped poplar wood. The next step in building a hugelkultur bed is to cover the wood with organic matter. Most people use turf turned upside down when it is available. Obviously, this includes the turf from carving out the bed space. In my case, I had both this turf as well as turf from digging out a drainage channel in the yard and a tiny pond. Due to the steepness of a hugel bed and the porous nature of the branches it is necessary to find a material that can hold dirt on the surface. I suspect that evergreen branches or straw could be used, but it might need more time to break down (with hugel beds almost everything is said to work over a long enough time period.) I suspected problems with the sod wanting to grow again, but didn’t see any, and some of it was very old and dead. Sod covering the branches on the peach hugelkultur bed. After the bed has been covered by sod or another material that can keep stuff on the outside of the branch pile material it is time to pile on another layer of organic matter. The first thing I did, was throw a thin layer of unfinished compost from the side of the pile over the side. After this I put down goat muck. In my instance I have some lovely neighborhood goats who drag a lot of food out of their feeder and turn it into a rich muck of hay, manure, urine, and goat hair. I use goat muck for just about everything, though it is tiring to haul. It was a good consistency for staying in place. It’s really an asset to have good access to so much fertilizer, and in my reckoning it is the perfect thing for this layer, but you can use straw or hay or leaves or anything else. Technically, the organic matter does not need to be a “fertilizer” as such, because most of the long term fertility comes from the breaking down logs and the rich soil life that develops as a hugel bed breaks down. The goat muck layer over the peach bed. After the layer of bulky organic matter has been laid down it is generally covered with another layer of of top soil or finished compost. In this instance I only had fill soil and no finished compost. I made the most of it, figuring I would throw the clay soil over and give it straw and things would work out fine. That wasn’t the case. You are supposed to seed hugel beds right away, but almost none of the covers grew (interestingly, the stuff on the north side did much better, I think because it had a consistent snow blanket and did not freeze and thaw.) The clay soil was far worse than I thought. It struggles to absorb any water and wants to crumble off. What’s worse, is I didn’t manage to get a straw mulch over the winter because I put it off for one day and it was months before snow was off the beds. The finished bed in August, just dead wheat. They say hugel beds never do anything on the first year as they mature, or at least very little. Unfortunately what they don’t say is if that is the first calendar year or the first season, because these were built in the Fall! I think due to the clay soil and older branches this one did far worse than most. Some things grew, but mostly things that slid off around the base. Early in the summer I mostly gave up on watering it. This year, I will finally actually have finished compost [See my post “The Wait for Finished Compost” about my struggles in this area] and I’m hoping with that and a cover crop I can plant my peach tree in the Spring, I certainly can’t this Fall. As much as I like the hugelkultur ethos of using free and available materials for your beds, I regret not buying a yard of topsoil mixed with a yard of compost to throw over the hugel beds and other new garden areas! The peach tree hugel bed in September, 2017. It has been covered with finished compost and covers are starting to grow. My second hugel bed, which was made a week after the first, is a large bed which has a six by ten foot base. This bed is for using as a general garden bed. The permanent planting will allow me to grow perennials and try new experiments. The six foot height means the beds actually have a great deal of surface area. It is generally recommended to make hugelkultur beds as tall as it is possible to tend to them, but almost all of the ones I see online are much smaller than this. Since I have already given instructions about how to construct a bed, I will share this one as a gallery for convenience. There was a thicket of horrible elms at our house when we moved in. I had already thinned them a lot, but when we bought the house I was able to destroy them. The elms taken down and hauled away, this area is actually yard again. The completed pile. It was 5 feet tall at this point. This is a side view of the completed pile. Some of this is also a wood ash that was cut back. Branches needs to be cut to make pegs to keep the lateral branches up. The completed large branch pile. I ran out of sod covering this thing, and i had carved out a lot of my yard for various purposes! I ended up putting 11 large wheelbarrows of goat muck to cover this thing. I was determined to not use more than 8! Agains I had to use fill dirt, and also ran out. i ended up mixing this layer with partially finished compost because I needed the organic matter. I thought it would break up the clay- it didn’t! This page will continue to be updated as I build more hugel beds and these mature. Hopefully next year they will be green and luscious and produce pictures of beautiful vegetables with very little work. I can’t imagine that I won’t have good winter cover crops this year since I will actually have finished compost to throw over before seeding it and am determined to get the straw over that in time this year.